Although gene expression profiling provides critical information, knowledge remains limited regarding the differential effects of molecular subtype on clinical course. This study evaluated the impact of molecular status on long-term patterns of failure in patients with non-metastatic breast cancer. 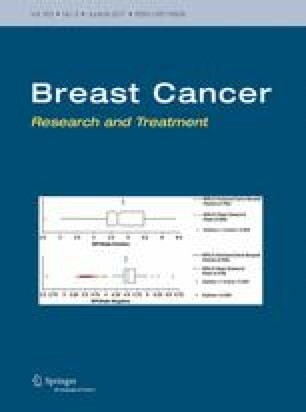 We analyzed data from 1181 individuals with invasive breast cancer undergoing surgery plus PORT from 2003 to 2011. Molecular subtypes were defined as luminal A (LA), luminal B (LB)-HER2(−), LB-HER2(+), HER2, and triple-negative (TN) based on the 2013 St. Gallen Consensus criteria. Competing risks analysis and baseline hazard rate function plots were used to explore subtype-specific recurrence patterns. The 10-year overall survival rates of LA, LB-HER2(−), LB-HER2(+), HER2, and TN groups were 96, 93, 94, 84, and 85%, respectively (P < 0.001). Distant metastatic events differed significantly according to molecular subtype (P < 0.001). In competing risks regression analysis, initial development of distant metastasis was the highest with TN tumors, followed by HER2, LB-HER2(−), and LB-HER2(+) subtypes (P = 0.005). Regarding preferential sites of distant metastasis, the risk of initial brain metastasis was significantly higher with HER2 tumors, followed by TN tumors (P = 0.001). A low-level but sustained metastatic risk increment was observed in luminal tumors, whereas TN and HER2 subtypes showed a short-term risk surge within 5 years. From the significant impact of molecular profile on distant metastasis, subtype-specific individualization of systemic treatment and close surveillance are suggested. The preferential and long-term risk of brain metastasis in the HER2 subtype underlines the importance of alternative anti-HER2 therapies. The online version of this article (doi: 10.1007/s10549-017-4206-8) contains supplementary material, which is available to authorized users. This work supported by grants from the Korean Ministry of Health and Welfare and to Kim IA (No. 0820010). This study was approved by the Institutional Review Board (B-1505/298-116). The retrospective design exempted this study from the requirement to obtain written informed consent from the patients.